Nearly a year ago, IMAN partnered with the Interfaith Youth Core (IFYC), Chicago Community Trust and One Nation to launch the One Chicago, One Nation. The project brings together Chicagoans of diverse faiths and cultures, with an emphasis on the Muslim community, to get to know each other through addressing local needs. The effort included a successful film contest hosted by LinkTV, the training of over 100 youth and adult leaders and a series of dialogues hosted throughout the city to address pertinent local issues. For 2011, we’ve heightened our focus on developing leaders and achieving concrete change in our communities. Community Ambassadors are proven community, campus and congregation leaders who will receive extensive training on managing interfaith dialogue and promoting a discourse of respect and cooperation across faith lines. They will learn from IFYC’s incredibly skilled trainers as well as draw from IMAN’s own unique model of community organizing to hone their skills in identifying allies, building bases and sustaining movements with respectful but effective tactics. From a total cohort of 60 Community Ambassadors, 20 will work directly with IMAN on crafting a plan to create and sustain a more physically, spiritually, and economically healthy community on the Southwest Side of Chicago. Drawing from the arts, health and wellness work led by our free clinic, and with a focus on economic development, the Ambassadors will create IMAN’s Guide to Community Health and Wellness. If you love IMAN, and more importantly the work that we do; If you have just 10 hours to spare each week between February and May; If you are committed to the concept of interfaith cooperation; And if you’d like to join an effort that will alter both this community and the way Muslims are perceived as contributors to substantive change in America, YOU NEED TO APPLY TO BE A COMMUNITY AMBASSADOR. 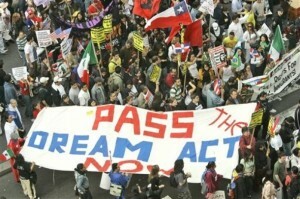 Comprehensive immigration reform has always been a core value and goal at IMAN. We see such reform as the recognition of both the human dignity and the socioeconomic contributions of undocumented immigrants. While a comprehensive reform of the immigration system remains our long-term goal, we are currently urging support for The Development, Relief and Education for Alien Minors Act, also known as the DREAM Act. This DREAM Act has widespread support and will provide a path to legal status for youth who entered the U.S. as children and who will complete at least two years of college or military service. It has been shown that such legalizing of so many talented and hard-working young folk will be a major boost to the American economy, making this bill not only the right but also the smart thing to do. As people of faith, principles and courage we need to be relevant to the great issues of our times. The crisis of immigration and immigrant rights is clearly one such issue, for how it is resolved, or not, will be one factor in determining whether we will have an inclusive or exclusive society, now and into the future. Now is our chance to have a principled and courageous voice in determining the direction of our nation. This is also our opportunity to stand with others in their struggles; if we do, only then can we have any hope and expectation that others will stand with us in our struggles. This show of solidarity, then, is also the right and the smart thing to do. The intersection of debates over issues such as immigration reform and national security provides an opportunity for building movements of solidarity amongst marginalized peoples. The challenge, however, in such joint mobilization and movement building is making clear and understandable the shared causes and similar consequences of these issues that superficially seem to affect only one marginalized community. In the absence of an ability to see and make these connections between our issues, the tremendous rewards of joint struggles tend to elude all of our communities. For IMAN, the human rights framework provides the basis for making these connections. 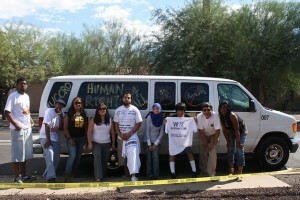 In this vein, and as a follow-up of the UCCRO Arizona Human Rights Solidarity Ride to Phoenix, Arizona, IMAN hosted a webinar Wednesday, October 13, 2010. Shahid Buttar is a nationally-recognized artist and civil rights lawyer. He has a J.D. from Stanford University and has worked for The American Constitution Society for Law and Policy, Muslim Advocates, National Association of Muslim Lawyers. He currently leads The Bill of Rights Defense Committee. Buttar led a conversation on the intersection of immigration reform and national security. Joining him was Rev. Dr. Patricia Watkins of TARGET Area Development Corporation to assist in analyzing their relationship within a human rights framework. This was the first of two seminars aimed at broadening the conversation on immigration reform. Click here to listen to Dr. Watkin’s portion of the webinar.